Easy to use, Icemaster 25 walk–behind manual grit / salt spreader improves the safety of smaller areas, such as pathways. *Special Offer* 3 FREE pairs of Ice Grips when you buy this grit spreader - see below for details. Icemaster 25 Grit Spreader takes the hard work out of treating paths, drives and car parks. Icemaster 25's simple, hardwearing design makes clearing ice from your site a breeze. The corrosion–free Durapol™ Material hopper holds up to 25kg of dry de–icing salt (we recommend Glasdon Ice–Melt™ ), and a broadcast spinner plate spreads the material evenly and consistently. The faster you walk, the further it spreads! Icemaster 25 features a flow control assembly mechanism. One lever opens and closes a plate in the hopper to adjust the amount of grit released from the hopper to the spinner. Icemaster 25 Grit Spreader is delivered in kit form as standard and should take approximately 45 minutes to put together. You'll need an 8mm spanner, a 10mm spanner, a Philips screwdriver and a pair of pliers. We can assemble the unit for you prior to delivery for an additional charge if you'd prefer. We're giving away 3 FREE pairs of Ice Grips with every Icemaster 25 order. 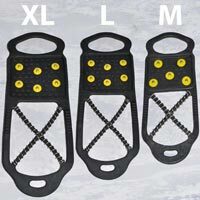 You will receive a medium, large and an extra large pair of Ice Grips so that you are well prepared for the Winter months ahead. Offer available on all manual grit spreaders. Hurry for a limited time only. Low maintenance materials for hassle-free use. Rotary agitator breaks up the de-icing salt for consistent spreading. Single lever regulates flow for simple operation. Rear stand and tough pneumatic tyres for comfort and convenience. Removable mesh filter sieves the spreading product before it enters the hopper. Sealed Durapol™ Material gearbox protects gearing system from harmful contaminants. Weight capacity: 25kg (approx. 2 x tubs of Glasdon Ice–Melt). Make sure workplace safety is at the top of your priority list, with our towable salt spreaders. Maintaining safety at your workplace through the winter months is vital. At Glasdon, our range of manual salt spreaders are here to help. Don’t get caught out this winter, check out our definitive guide on how to maintain and service your grit spreader. A 5 point winter safety checklist to help you manage the additional hazards which can occur in the autumn and winter months. There are many differences between ice melt and rock salt, but the source of these differences is in their chemical composition. Which one is right for your requirements? We understand that choosing the right salt spreader can seem daunting. So we have compiled this useful short guide to help you select the most suitable product for your business. How does gritting work? When's the best time to grit? Check out this infographic for a look at some of the facts. As parts of the Ireland turn decidedly autumnal, a large number of our customers are beginning to think about their safety responsibilities when winter rolls in. As well as ensuring you have enough grit.